China’s economic growth may be slowing down, but that hasn’t yet stopped Chinese consumers from spending big on luxury brands. While Apple (AAPL) blames sluggish iPhone sales on China’s economy, luxury brands from the U.S. to Europe record steady growth in the region and express confidence in its affluent young consumer base. “While we understand that there are some continuing concerns around Chinese luxury spending, we view China's heightened emphasis on driving domestic demand as entirely aligned with where we are making our investments across brands,” said Victor Luis, Tapestry CEO. Tapestry’s Coach brand has launched targeted marketing campaigns to capture share in China. And it also bought back its Kate Spade and Stuart Weitzman businesses that it didn’t wholly own previously, which shows its commitment to the Chinese market. “When we think about that on a global basis, often it is our international customer, our Chinese tourist customer and our Chinese customer at home that is most willing to pay for the top-of-the-pyramid product, with the highest AUR [average unit retail], whether that's in handbags or in ready-to-wear and so forth,” Luis said on Thursday. LVMH, the Paris-based fashion giant which owns Louis Vuitton and Dior, also reported strong sales growth in the Chinese market last month and called it “buoyant,” though the company didn’t offer specific numbers. “Based on the numerous sentiment surveys out there, it appears that Chinese consumer confidence is slipping, but from what we're seeing, well-marketed products and services continue to experience solid growth,” said Mark Tanner, founder of Shanghai-based research and marketing company China Skinny. Tapestry’s direct competitor, Capri, which runs Michael Kors and Jimmy Choo, reported a mid-single-digit increase in sales in mainland China in its earnings announcement Tuesday. Jimmy Choo, the high-end shoe brand, showed the strongest growth in China among all regions. The higher growth in a top-tier brand is echoed by the beauty giant Estee Lauder (EL). Led by China, the company’s Asia-Pacific category grew at a double-digit rate. Among all its beauty names, the luxury skincare and makeup brand La Mer and Tom Ford gained strong traction in China. “Luxury brands have been in high demand in China, and our sales mirrored that trend as they increased strongly. 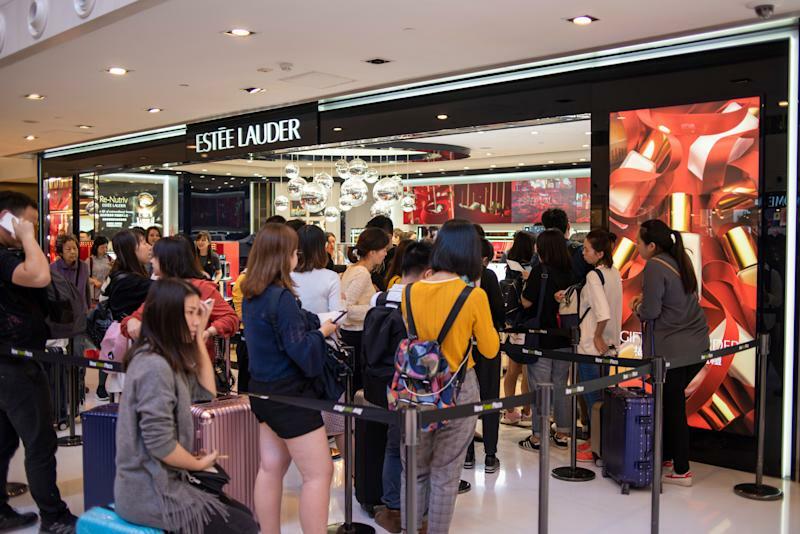 Demand for prestige beauty from Chinese consumers has remained strong in spite of macro issues and potential risks to the economy,” Fabrizio Freda, president and CEO of Estee Lauder said on Tuesday. The company hasn’t seen any impact of the macro headwinds and remains optimistic about the long-term prestige beauty business in China, citing strong demand from a young and growing middle class in China. Chinese demand for high-end brands don’t just boost domestic sales – it also helps tourist-driven sales in the UK, where Estee Lauder sees a macro risk because of Brexit. La Mer’s travel retail business in the UK skyrocketed thanks to new flights from China. Estee Lauder’s rival L'Oreal, which reported earnings on Thursday, also saw strong Chinese demand for its luxury brand Lancome, while citing a sluggish market in France and the UK. Alibaba, China’s e-commerce giant, has reported deceleration in big-ticket categories like home appliances and mobile phones, while it saw a uptick of consumers upgrading their lifestyle by shopping for electronic toothbrushes and electronic beauty devices on its platform. Krystal Hu covers technology and China’s consumer market for Yahoo Finance. Follow her on Twitter.